The last couple of days have been fairly uneventful. The weather wasn’t great yesterday, so I spent most of the day on my computer working on my software project. I finally got out for a bit around dusk and went for a little walk. 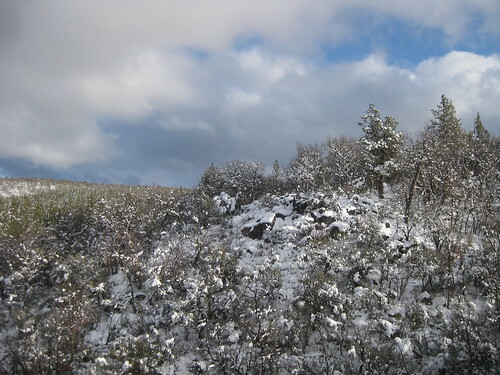 Today, I went for a walk in the afternoon, and came upon a cluster of nice (dead, but mostly still upright so free of snow) mountain mahogany trees, so I went back to camp, picked up my saw and a pack to go collect some firewood. As I was heading back to the trees, a startled jackrabbit ran off from a nearby bush. I instinctively reached for my gun, but quickly realized that what I had cradled in my arms was my cordless reciprocating saw — hardly the right tool for hunting rabbits. I noticed that half a bag of potatoes I’d left in Hut 1.0 overnight for one night had started to go bad. I guess they froze during that one night spent in Hut 1.0, then thawed after I moved them to Hut 2.1 and started to rot. I boiled some of the worst ones over the stove last night, and fried them up for breakfast this morning. They tasted a little dry, but were otherwise edible. I’m currently making potato and leek soup with the rest of the potatoes that might’ve gone bad. I still have the other half of the bag that I’d stored in Hut 2.1 to start with, which are fine and should last a while. I also have a couple of pounds of sweet potatoes, so I’m pretty good in the potato department. Otherwise in the food department, the pot of curry I made last week lasted me 4 dinners, and I had the last of it last night. I’ve also discovered that making pancake batter in a ziplock bag works great. It spares me the trouble (and water) of cleaning a bowl, and I can throw the unused portions in the cooler. My electricity supply is being constrained somewhat by the overcast weather. I used a lot of power yesterday when I spent the better part of the afternoon and evening on my computer, which, combined with the overcast weather today, put me in a slight energy deficit (i.e. I’ve used more power than I’ve generated). My battery array is still above 12 Volts so I’ve got plenty of power, but I decided to spend the evening with the lights off today to conserve power. I’m still just using the single 100W panel, and haven’t set up the new 45W panels yet. I figure if I could get by with less, I might as well. It looks like more snow and colder temperatures are predicted for later this week. I’ll probably go gather some more firewood tomorrow, just to shore up my stockpile, even though I think I have enough to last me at least another 2-3 weeks. I’m actually quite happy about the snow. In my ideal world, it’s either snowy or sunny, but never rainy. Now that I think of it, that’s kinda how it’s been up here. Overall, things are going surprisingly well. I haven’t yet faced any major issues as I enter my second week of my continuous stay here, and I’m enjoying each day, even if I’m not being as productive as I perhaps could be… My floor is still half unfinished, but I’m sure I’ll work up the motivation to finish it one of these days. After all, I’m not in any particular hurry. But, other than that, I’ve got plenty of food, plenty of water, and so far, plenty of firewood to stay warm. So, basically all my needs are met, and I have no concerns there. I guess the one thing that’s worth noting is that I’m still adjusting to having internet access up here. It’s certainly a mixed blessing, though it hasn’t been as detrimental to my life here as I feared it may be. Though, I still spend more time on the computer, and less time reading or simply pondering than I used to. It’s not necessarily bad, but different. But then, a lot of things have changed in the year and half that I’ve been on this property. I used to live in a tent, without decent electrical lighting, without internet, without cell phone access, without heating. It’s hard to say that things are worse, but it seems that something is lost every time I add a new convenience or comfort. But, that’s what this journey is about. It’s about finding that right balance for myself, and it’s an on-going process. Had another late-ish start today, mostly on the account of having trouble getting out of my nice warm bed to brave the crisp air. 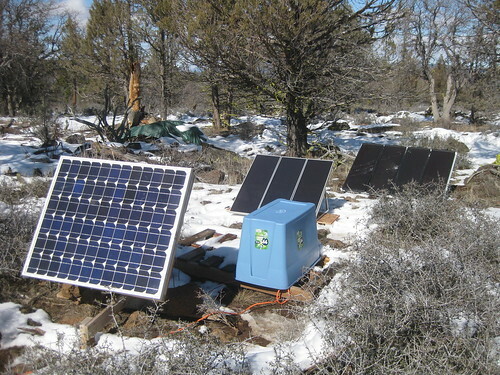 Eventually, the combined realization that 1) it was sunny out, and 2) my solar panel was pointed in the wrong direction, got me out of bed in a hurry. I had my usual eggs, greens, and tortillas for breakfast. The eggs were the last of the dozen I’d bought in January, and were fine despite being 3 weeks old, and having been left in freezing temperatures. The tortillas, however, had frozen, but other than a few at the top having frozen in weird shapes, they tasted fine. 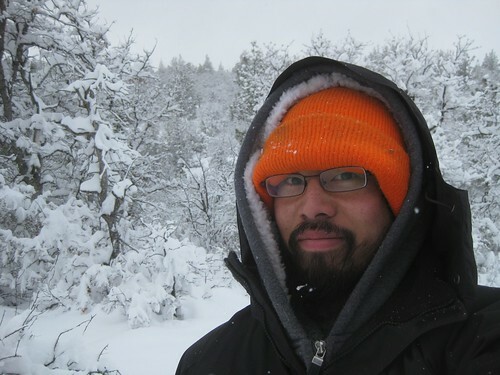 I spent the early afternoon gathering more snow, and collecting some twigs and branches that I use for kindling. Before starting Project 31, I had 2 buckets filled with kindling, but already burnt through one. Since the sun had dried out some branches, I decided to fill up that bucket again, so I still have the other bucket. I also have a large pile of branches under a tarp, if dry branches aren’t otherwise available. Later in the afternoon, it started snowing again, so I worked some more on the hut floor while listening to music. 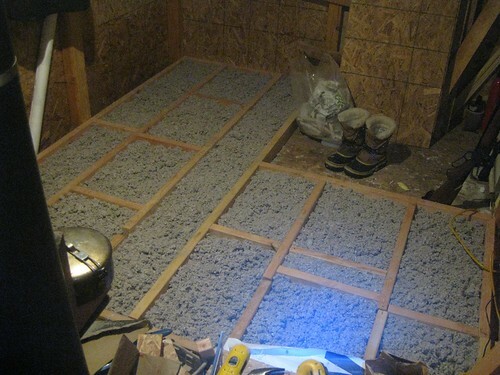 At this point, half the floor is done and insulated. 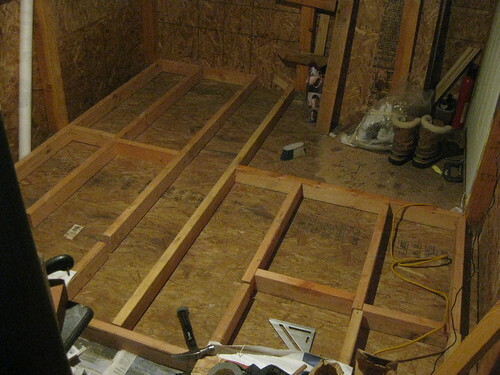 The raised floor feels much, much more solid than the original floor, partially because the joists on the raised floor are spaced closer together and are laid perpendicular to the original joists to spread the load, but also because the OSB is oriented in the right way (after all, the “O” in “OSB” stands for Oriented). I still need to do the other half, though it’s more like 3/4 of the half since the area near the door will not be raised. The lowered floor near the entrance is a standard feature in Japanese houses, where you’re expected to take off your shoes. 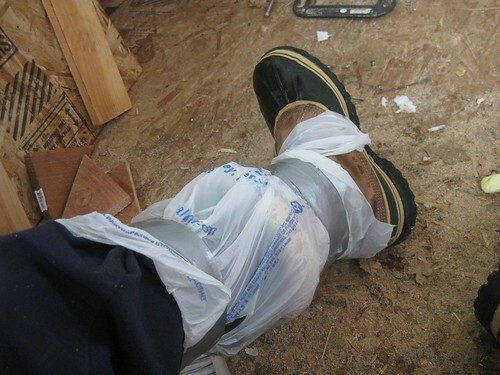 Your shoes stay in the lowered area near the door, and the height difference also helps keep mud and dirt out of the rest of the residence – a feature I intend to take advantage of in Hut 2.1. In general, I’m feeling good. Even though this is Day 2, I got here on Monday, so I’ve been here 4 full days now, and I’m settling in. It’s nice to have everything I need here, and not have to worry about going into town, or the roads not being clear (seeing how they haven’t been anyhow). There’s also a certain peace of mind in being committed to staying here. I get emails about things happening in the city, and normally, there’d be a pang of doubt: a part of me would wonder if I might have a better time there than here. But, now, there isn’t. I simply file away those emails, because I am here, not there. 29 more days to go. I guess this is technically the second day, but since yesterday was Day Zero, today would be Day 1. The idea is that I can leave on Day 31, while if I’d started counting at 1, it wouldn’t be 31 full days until Day 32. Though, I’m sure in a few days it won’t make a huge difference either way. Let’s see. I didn’t accomplish a whole lot during the day today. I got a late start, so instead of cooking breakfast, I just toasted a bagel, slathered some cream cheese and strawberry jam, and scoffed it down with some coffee. The only other noteworthy day-time activities were a couple of short walks I went on around the property. It stayed more or less below freezing so all the trees are still mostly covered in snow, which is really quite pretty. There were a few snow showers, and during one of them, I just stood in the doorway with the door open, and watched giant snow flakes fall silently to the ground. 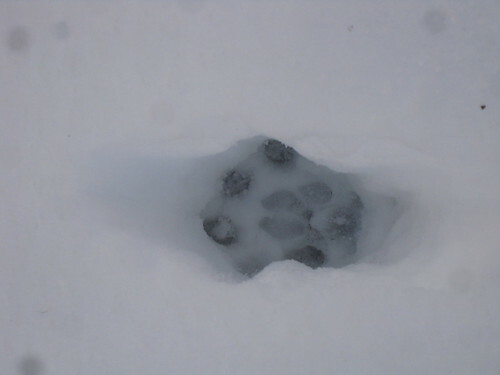 While on my walks, I tried to spot animal tracks, but all I saw was a single deer track on a known deer trail. Normally I’d see some rabbit trails, but I didn’t see any today. Maybe it was too cold last night, and they just stayed in (I wouldn’t blame them). Or, perhaps I was too distracted by the scenery, that I missed the tracks that were there. I think this is about as gorgeous as my property gets, and walking around the snow-covered woods made me feel like I was in a fairytale (though, hopefully one without big bad wolves, or witches that try to eat me for dinner). For dinner, I cooked some Japanese-style curry, with pork, onions, potatoes, carrots, and brussel sprouts. I briefly sautéd the ingredients in a pan over the propane stove, just enough to get the meat browned, but then let it simmer in a pot on the wood stove for a few hours. I made a big pot full, so there’s plenty left. I’ll probably leave the pot on the stove tonight, so that the pork can cook a little more until it’s nice and tender. In general, not knowing how long things will last makes it harder to ration my supplies. A part of me wants to use up the fresh veggies while they’re still good, but I also don’t want to use up all my vegetables early on, and only be left with canned goods for the second half. Of course, the worst case would be to let things spoil, but I guess I’ll just have to keep a close eye on my supplies, and use them wisely. I realized that I hadn’t done a very good job of utilizing the stove’s heat yesterday, so I did a little better today. I’ve had both burners occupied for most of the evening, partially to cook, but also to melt potfuls of snow. I’ve decided to try and get as much snowmelt as possible, because it’s a lot cleaner (and better tasting) than the old rainwater I have in my bins. On the downside, my wood consumption rate is much higher than it was in previous weeks. Part of it is that it’s just simply colder than it was in January (right now, it’s 12F/-11C), but I’m also using the stove more for cooking, so I burn more wood to get it nice and hot. One other thing I’ve come to realize is that, ideally, I should use different kinds of wood for cooking. I’ve been gathering mountain mahogany, which is the densest wood on my property and therefore burns the slowest. That’s great for heating, but when I’m cooking, I want the stove to get hot for short periods at a time, and for that, oak and juniper would probably work better. I still haven’t set up my 45W solar array, so I’m still just running off of my single 100W monocrystaline panel, which obviously hasn’t been producing much power during these snowy cloudy days. I spent most of the evening with my lights off to conserve electricity, and ran my laptop off its own battery power. My battery array still hasn’t dropped below 12.4 Volts, so I’ve got plenty of power, but I’m not sure how long it’ll be before I get decent sunshine, so I might as well conserve if I can. Okay, that’s it for today. 30 days to go.